AusBonsai | View topic - PJF correct size pot? I decided it was time to pot my PJF, but I’m now questioning the size of the pot I had available.... is this the correct size? What do you think? Re: PJF correct size pot? Thanks John, no this one will be kept small and I’ll start ramification now! Thanks ! Hmmmm......why use a Japanese pot for a native tree? There are plenty of fine producers here! 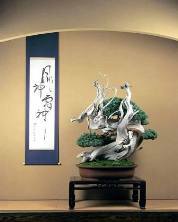 Thymetraveller wrote: Hmmmm......why use a Japanese pot for a native tree? There are plenty of fine producers here! Just because it is an Aussie tree doesn't mean that it is unsuited to a foreign pot or that it will be suited to a local pot. Regardless of origin, we should just ask 'does this work'. My answer, yes it does. White is a nice offset to either a foliage or defoliated fig and the size is good for me - really emphasises the trunk girth and taper. How can you tell is a Japanese pot? I think its to match the Japanese beer!!!! I also think the pot size is OK.
Watto wrote: I think its to match the Japanese beer!!!! Hahaha yeah what can I say... I love everything Japan!!! I do have 2 beautiful local made pots but I’m waiting for the right tree! Aha... I think the problem is that I can only see the beer bottle in the picture; the rest is cut off. I thought you were talking about the beer bottle! Actually I agree with Thymetraveller here - the pot is mass produced either from Japan or Korea. It's a "safe" pot - You could plant a cactus in it and it would still "work." Is it exceptional - No. If it's all you've got, than use it till something better comes along & keep striving for excellence. Thinking ahead, the pot may soon look much smaller once your fig starts to leaf out? Thanks for your contribution and yes that’s a mass produced pot from Japan but I don’t consider my PJF a finished Bonsai or a tree I’m proud of so to me it doesn’t deserve any expensive pot yet... maybe one day who knows! I think there are 2 different answers to whether a pot is the right size - horticultural and aesthetic. Horticulturally the tree will manage in this pot but that's only because it is a fig which can manage in more limited space than most other species. I think it is better for beginners to overpot a bit rather than try to cram trees into the smallest possible pot. Water and feed are much harder to manage with smaller pots. Aesthetically I actually think this pot is a bit small for the tree. To me it looks like it will tip over with little provocation. As KCAR points out, soon there will be a canopy of leaves which will increase the size of the tree. Will it still look balanced then?